Lomuria N’alekirion (left) has no formal education. Until recently the only life he knew was herding his cattle across a vast, semi-arid landscape, frequently coming into conflict with other herders and wildlife as they sought the same dwindling pasture and water. Any money he got from selling a goat, he’d spend straight away – saving was never something he’d ever thought about. 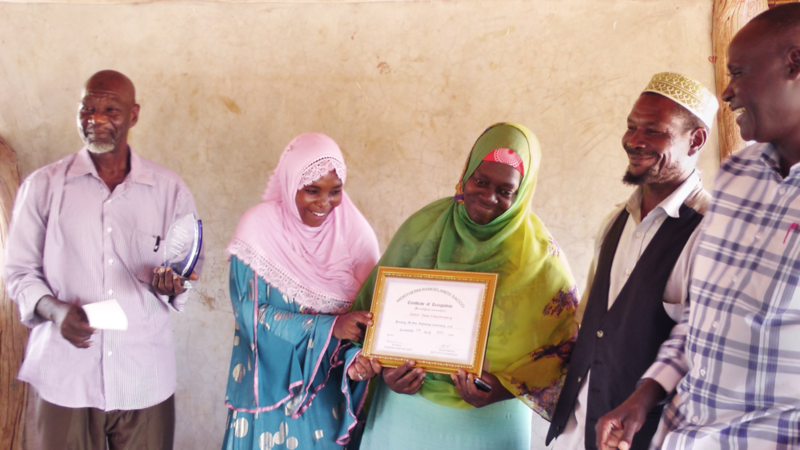 But on the 11th April 2019, Lomuria stood in front of a crowd of over 65 people, crowned Best Enterprise Agent 2018 for the Northern Rangelands Savings and Credit Cooperative (SACCO). He was commended for his creative business ideas and support to other budding young entrepreneurs. Lomuria, from Nasuulu Conservancy, was one of the first people to join the Northern Rangelands SACCO when it was established in 2016. Started with support from USAID, it provides relevant financial training and an accessible savings and loans scheme to young warriors at risk of being caught up in the front lines of conflict, as well as women - who are frequently denied business and education opportunities by a patriarchal society. There are currently 2,052 members in the SACCO - 63% of which are women. 63% of current SACCO members are women, many of whom are accessing loans for the first time to start their own businesses. The award came at the end of the SACCOs annual delegates meeting (ADM), which was held in Kalama Conservancy and attended by SACCO members from 17 community conservancies across Isiolo, Marsabit, Samburu, Tana River and Laikipia counties. They were joined by the SACCO Chairlady Pauline Longojine, former chair of Sera Conservancy, and SACCO Vice Chair John Lukato from Nakuprat-Gotu Conservancy, as well as staff from NRT Trading and NRT, government auditors and Waso Assistant County Commissioner Bernard Onyango. The ADM celebrated some punchy figures. Since the SACCO began, Ksh. 7.2 million (US$ 72,000) has been invested as shares and accrued as savings. In 2018 alone, this figure was Ksh. 4.9 million (US$ 49,000) - with Ksh. 3.8 million (US$ 38,000) of that being savings accumulated by members to support their families and businesses. The member-driven SACCO uses mobile money to make savings and credit accessible even when the nearest bank is hundreds of miles away, and is helping to create an environment for businesses to thrive in remote conservancies. In doing so, it is significantly contributing to peace efforts, as young men move away from conflict and in to businesses, as well as women’s empowerment and reducing reliance on livestock. Jennifer Lentaam from Meibae Conservancy won the award for Best Female Saver 2018, after saving Ksh. 75, 000 ($750) in one year through the SACCO. The mother of five used to rely on her father for subsistence income, but she now runs a thriving shop and fuel station, started with funding from the SACCO. “These days, I don’t ask my dad for anything!” she says. After completing the necessary financial literacy training, facilitated by NRT Trading, SACCO members are required to pay a 500-shilling ($5) membership fee and are asked to invest in a $10 share capital with a minimum monthly deposit of $3. After a 6-month membership, the SACCO will loan members three times their savings with no interest. Critical to its success is the fact that the SACCOs are run for and by the members. Lomuria has been elected as a ‘Superstar Moran’ (warrior), which means he is charged with debt collection within his group, and raising financial awareness among his peers. Proactive conservancy managers are important too – Moses Kinapu of Ltungai Conservancy won ‘Most Supportive Conservancy Manager’ for his efforts in mobilising the community and ensuring equality in SACCO membership allocations. Lower Tana Delta was announced the overall best performing conservancy in the SACCO — having paid back their loan of KSH. 1 million within one year in 2017, they graduated in 2018 to a loan of KSH. 4.6 million to support farming and small businesses. Lomuria, who bought a solar power unit with his first loan and offered a phone charging service to his community for a fee, is convinced that peace and business go hand in hand. When he isn’t busy on his farm (he now grows and sells vegetables) or running his shop, Lomuria champions for business and peace amongst his peer group – persuading them to move away from the vicious cycles of stock theft and tribal feuds. “Without peace no business will thrive,” he says.